When Khadijeh couldn’t afford to pay for the hospital delivery room, a stranger offered to buy her newborn son. As a 33-year-old Afghan woman living in Iran, she was incredibly vulnerable. Her husband had just passed away, and she alone was caring for their three children and her sick mother. Even her extended family let her down, encouraging her to accept the stranger’s offer so she could support her other children. Khadijeh couldn’t bring herself to part with her son and sever the tie with her late husband. Someone at the hospital recommended she talk to the United Nations. Soon, the UN helped her family move to Slovakia, where they waited to relocate to a country that could take them permanently. After six months, Khadijeh was elated to learn she would be moving to the U.S. She was confident her children would have a better life here, even though she’d never heard of Chicago. 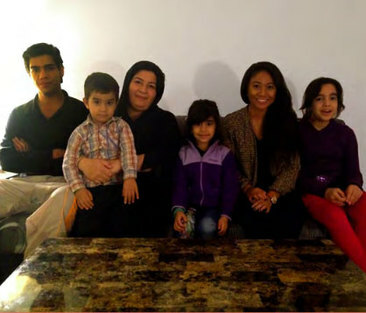 RefugeeOne staff met Khadijeh and her four children at the airport and took them to their new apartment this June. Living in Slovakia prepared them for Chicago winters, but the family had given away most of their possessions. Khadijeh is grateful to RefugeeOne for finding an apartment for her family, giving her and her children coats and boots, and for introducing her to Chicago’s Afghan community. Local Afghans gave her family two beautiful rugs to make their apartment feel more like home. RefugeeOne’s partner, Urban Muslim Minority Alliance (UMMA), also gave her a thoughtful Ramadan gift, which made her feel welcomed. 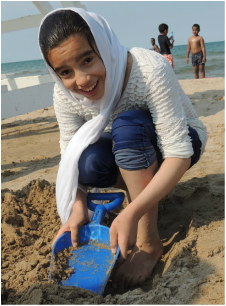 From the moment she arrived, Khadijeh worked hard in RefugeeOne’s English classes and was consistently at the top of her class. After only four months in the U.S., she applied for a job at Five Star Laundry and was hired on the spot. It’s a physically demanding job with a 90-minute commute on public transit, so she isn’t home to make dinner for her children. She often worries about them, but they look out for one another and her 17-year-old son especially helps around the house. RefugeeOne also arranged for childcare for her youngest child. Today, Khadijeh is very happy that all of her children can go to school, especially her 17-year-old son who would need to have a job if they were still in Slovakia. This summer, the children were counting the days until school started. The two middle daughters, ages 12 and 6, love attending RefugeeOne’s after-school program and making new friends there. Khadijeh wishes she could help her children more with their schoolwork. She can't always understand their homework or the permission slips sent home but is glad that RefugeeOne staff is able to help. 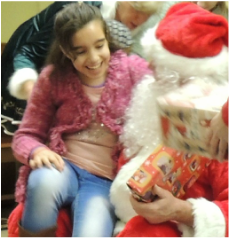 She’s also grateful that Caitlin Martinez, a RefugeeOne volunteer, visits the children twice a week to help with homework and English skills. Caitlin, a senior at Northeastern University, uses homemade flash cards, dialogue games, and a sticker incentive system to help the children with their homework. Once their work is done, everyone loves dancing to Shakira. Khadijeh hopes that her children will get a quality education and find good jobs, which is why she is willing to work so hard. "Everything I do is for my children." And she gives thanks to have them all with her.